Back in 1972 German rock band Cacumen took off but decided in 1986 to proceed under the more familiar name Bonfire. Both dates indicate that, with latest release Branded, the band celebrates their 25th (or should we say 40th) anniversary. Quite a milestone, but for some reason German rock bands show great resemblance with Japanese cars: they seem to last forever. This is underlined by their compatriots Scorpions: they only threw in the towel after a three decade plus career. For years I have been following this band, but having said that, I must admit I was little anxious about this new record. Most of their previous outings amused me, but did not leave the same lasting impression as their first two records Don't Touch the Light and Fireworks did in the Eighties. Moreover, after a flurry of commercial ballad and best of albums, a successful, but rather dreadful World Cup 2010 hit cover of the German hymn and a sort of soundtrack of a German play (The Rauber) the band managed to mutate from an authentic rock band into the German version of Bon Jovi. However, times can change. Whether it was the understanding of the band to leave the commercial swamp and push themselves back on serious track or the recent resurgence of the melodic rock genre, I don't know. What I do know is that with Branded the brainchild of Hans Ziller and Claus Lessmann is flying under the serious rock radar again. Opener Deadly Contradiction sets the tone with pure and simple guitar oriented hard rock with catchy melodies and what follows is a string of 9 quality melodic hard rock songs with a nice eighties touch that remind me of the Bonfire I once knew. The double guitar sounds great throughout the album, Claus Lessman's voice is better than ever and the play list shows depth and variety. Song wise there is nothing new here (who was expecting that anyway). Yet the song writing is solid. Musically there are zero weak spots and, with 40 years experience under their belts, the album sounds as professional as can be. Highlights are the punchy rocker Loser's Lane, the melodic but flowing tracks Save Me and Close To The Edge and the slow but powerful Better Days. With Let It Grow and Hold Me Now they have succeeded in adding just the right number of ballads. The thing I don't understand is the addition of two acoustic bonus tracks. They seem to be a bit of an obligatory attachment and make the album close in bleak fashion. Maybe two live tracks would have been more fitting. Nevertheless, they will not erase the feeling that with Branded Bonfire show they are still a force to be reckoned with. I guess this old car will add a few more miles the next few years. 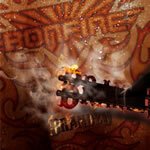 Bonfire's Branded, the brainchild of Hans Ziller and Claus Lessmann, had the band flying under the serious rock radar again.